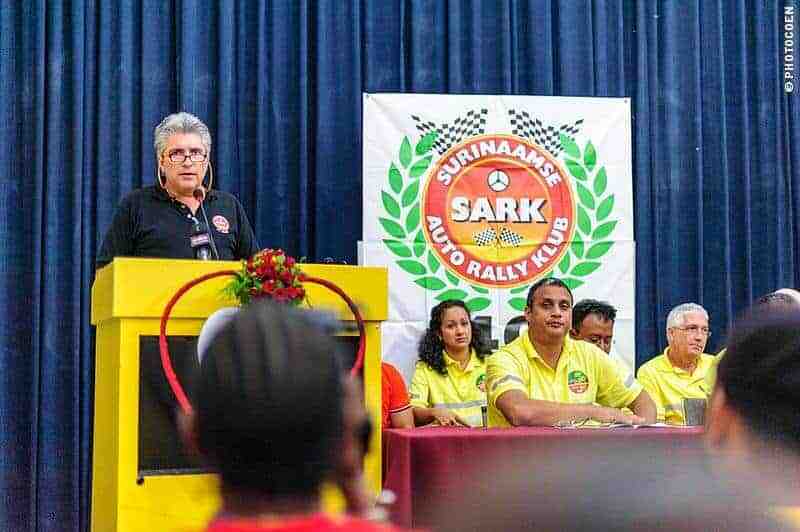 Throughout the year, SARK organizes car rallies in Suriname. 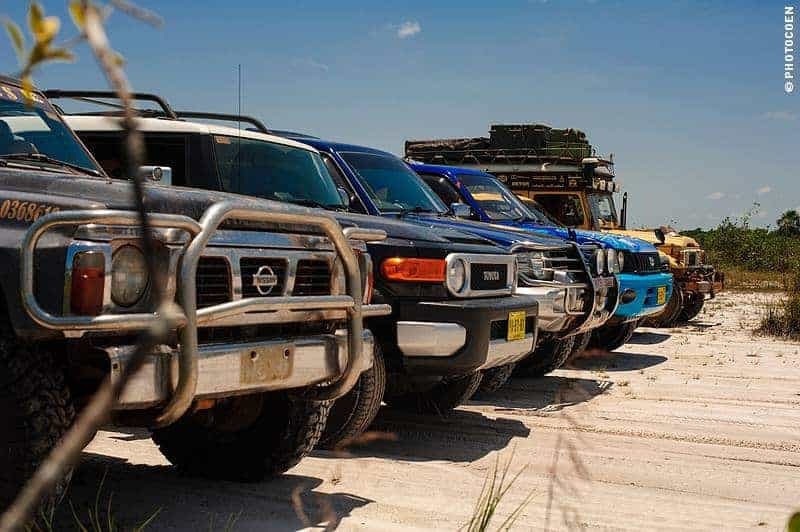 The two biggest events of the year, the 18-hour SOL Adventure Car Rally and the 4-day Savanna Rally take place in October and November. 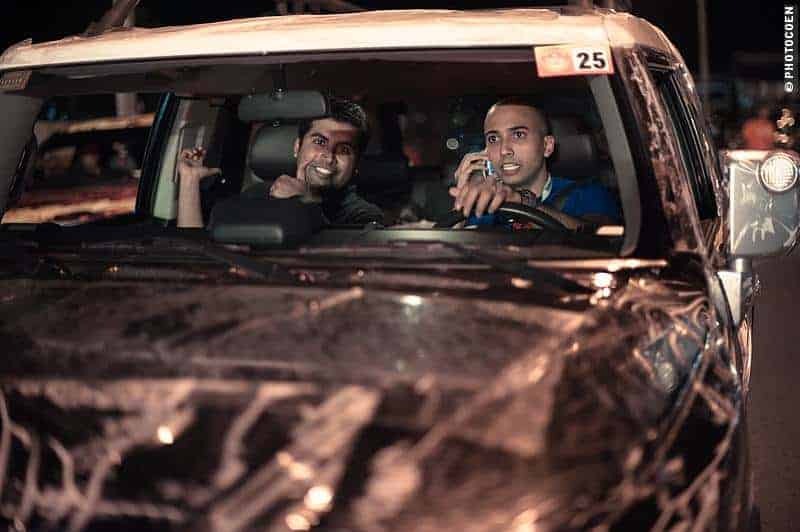 Participating in a car rally was totally new to us and quite a challenge. For once we changed roles: I drove and Coen navigated, which turned out to be a perfect move. Both times we ended in the top 3. In the Touring Class no less, but we all have to start somewhere, don’t we? Besides, driving these rallies with a 2,70-meter-high, fully loaded Land Cruiser had its additional challenges, like you’ll read below in our SOL Rally adventure (since we were so focused on driving we hardly took pictures during this challenge, so this story below also includes images of the 4-day Savanna Rally which we drove one month later and which covered similar terrain). Saturday 9 pm. We enter the SOL gas station where the first of sixty teams is about to start. As I drive up the departure ramp we see our first obstacle: a banner hanging way too low. It is untied by an organizer and we can start without ripping the thing apart. We answer a couple of questions for television and off we go, me at a snail’s pace down the ramp while Coen reads the first assignment in the road book 1. It is 9.37 pm; night has fallen 2.5 hours ago. In order to understand this story, you should know that SARK rallies are not about driving as fast as possible from A to B but are navigation rallies with different type of charts. The rallies consist of many stages, each of which has a minimum and maximum time allowance. Arriving at a checkpoint too early or too late will get you penalty points. 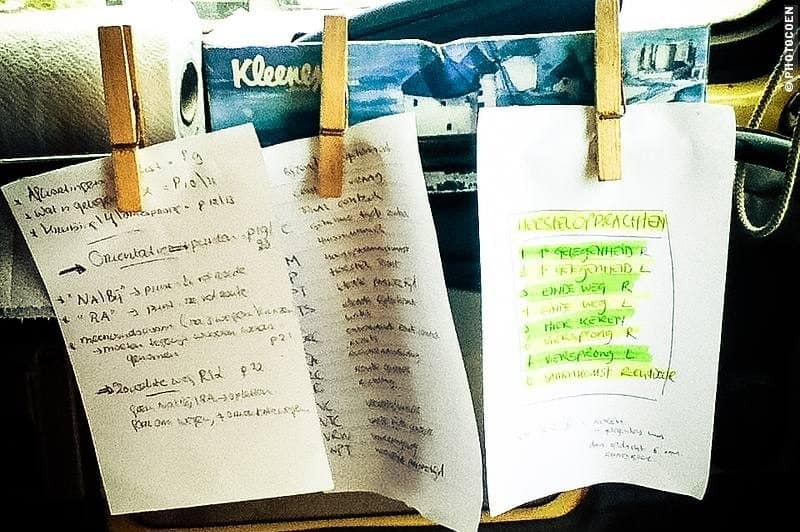 Since I am totally unfamiliar with car-rally language in English, forgive me my probably awkward descriptions of the assignments. The first stage consists of a herring-bone chart: a long line – the road we’re driving on – with numerous (dotted) sidelines that we have to skip. 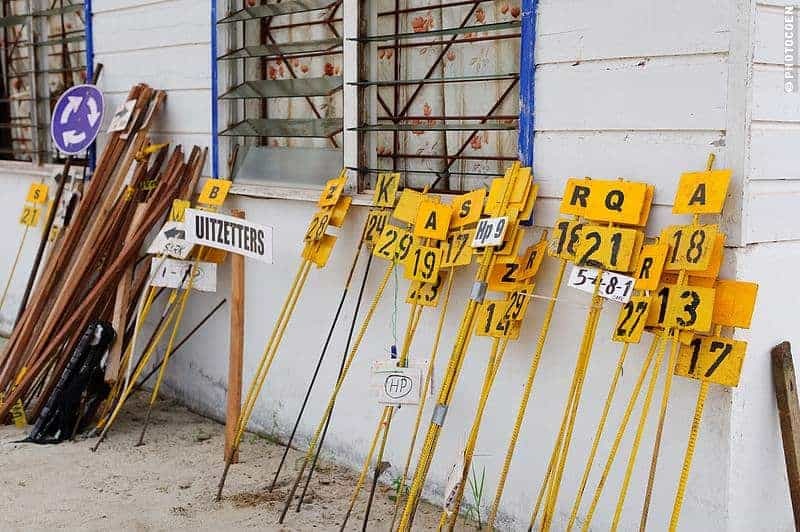 Depending on the system of the herring-bone chart, of which there are 8 variations, the sidelines indicate paved roads, paved and unpaved roads, roads and entrances to parking lots, etc. The herring-bone chart we now face consists of 124 assignments and includes 3 variations. Fortunately, there are HPs – Herstelpunten in Dutch, which I will translate as Recovery Points here. When lost you can drive to such a Recovery Point, thereby skipping a part of the assignment. Of course this will get you penalty points, but this way you won’t keep falling behind on your time schedule and it enables you to pick up the rally again. Initially we are doing great. Rally cars zoom left and right of us, among which a lot of fancy four-wheel drives fully covered in sponsor stickers, as well as a brand-new Land Cruiser FJ entirely wrapped in plastic to protect it from trees scratching the paint. It may be functional but for now it looks like a car in a badly-fitted condom. We happily turn left or right, cross intersections until at one point we find ourselves utterly alone. Where has everybody gone? Soon it is clear that we are totally lost. “Let’s find that Recovery Point,” I conclude. The Normandie Street is not to be found on the GPS but we have a roadmap. 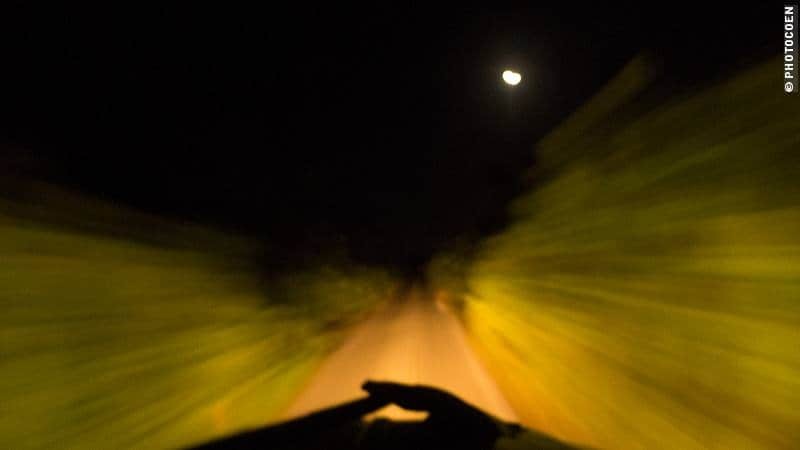 We find the road, which confuses us only more. “How can this be? We are parked with our rear to the Toevlucht Road, but we point northward and not westward as we should according to the road book,” Coen remarks. Since we’re newbies, we assume that we misunderstand the assignment, however, afterward it appears a mistake has crept into the text. “We are losing too much time, let’s move to the next,” I suggest. Recovery Point 04 is even more confusing. We don’t know what to make of the description ‘24935’ and wonder how we can face the Viool Street when standing in the Piano Street when both streets are parallel to each other. Only afterward somebody points out how the Viool Street, in fact, is L-shaped. Time passes and optimism turns into irritation. Nothing for it but to drive to Recovery Point 05: Commissaris Weything Road and Leiding 9. 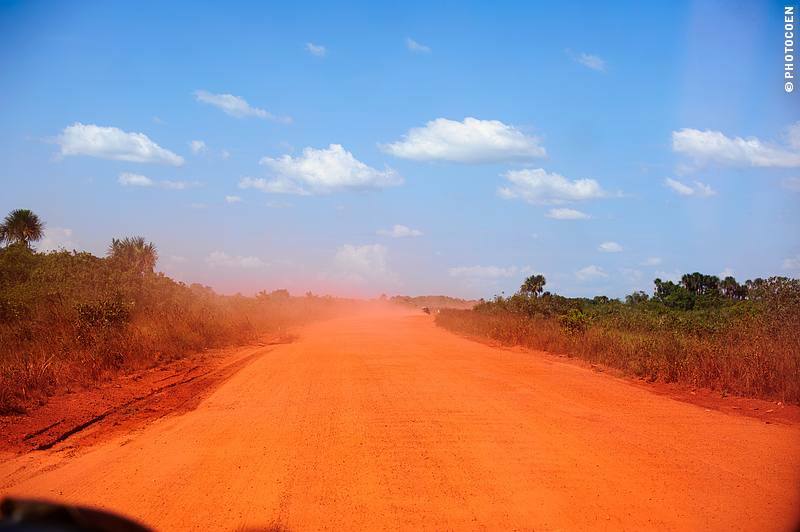 Neither is to be found on the GPS nor on our roadmap – the disadvantage of driving in a still largely unfamiliar country. Irritation aggravates and turns into being totally fed up. It is almost midnight and the first tiredness sets in. “Next. Recovery Point 06,” Coen states. 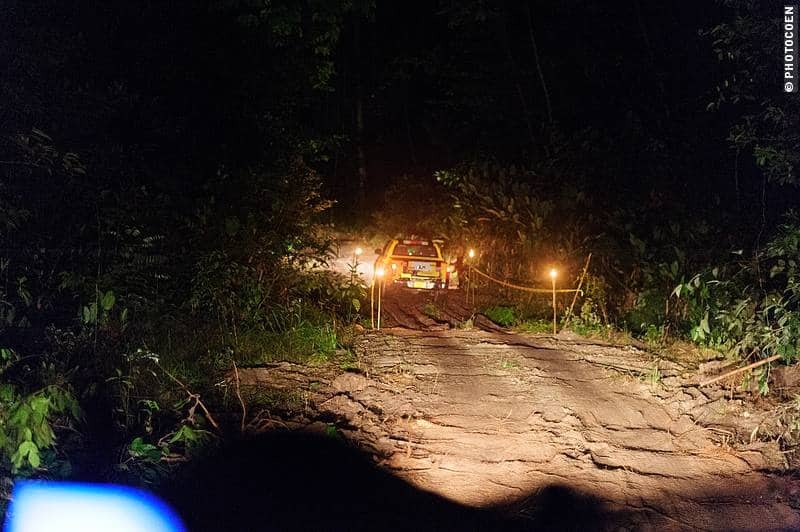 We find it because we are familiar with the Oost-West connection and see a rally car there that we can follow to the Recovery Point. Fortunately, we are done with that horrendous herring-bone chart and can start the second stage perfectly on schedule. We arrive at our first checkpoint. 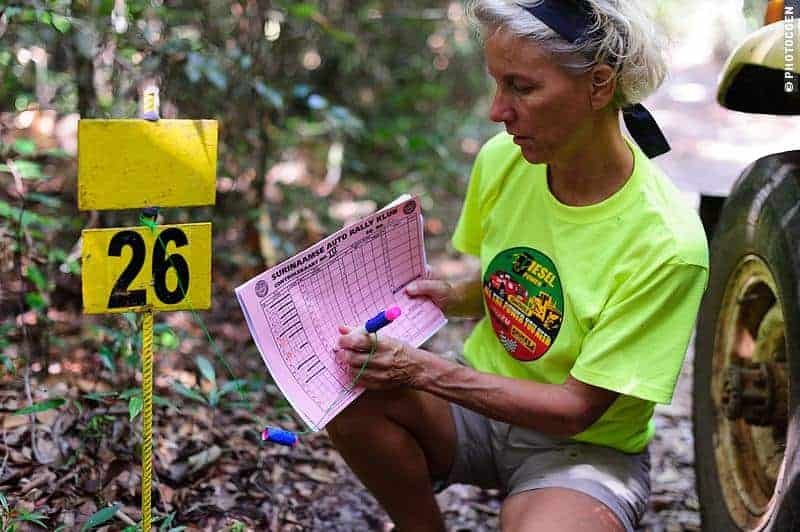 Throughout the night we will come across teams dressed in yellow polo shirts that either check our time schedules or scorecard with ORCs: the Dutch abbreviation for Unmanned Registration Points. These are small yellow signs along the road consisting of a number and letter that you have to jot down. ORCs will tell the rally committee where we drove the correct route but will also betray that we’ve gone astray. Coming across these ORCs doesn’t mean you’re on the right track! “Just wonderful, a straight hit from the start to Recovery Point 06,” we say with a bit of a sour smile. “Pay attention to the ORCs,” they advise us. We’re in good spirits. We have to follow blue and red lines and arrows drawn on maps in our road book. There are all sorts of charts to interpret, which Coen is good at reading and interpreting. Now that we are driving again, having at least the feeling we’re going the right way, the rally is fun again. It is 2 am. I feel surprisingly awake. Due to the hectic searching and struggling we really don’t have a second to realize what time it is. We traverse the town of Groningen. We do well here. Rally cars buzz about, which to us is a confirmation we’re on the right track. But the town offers its own challenge. We are the only car that measures so high and there are numerous low-hanging electricity wires. It takes concentrated driving, watching for ORCs, which is my job, as well as watching out for those lines at night. I have to pass underneath them at a snail’s pace and twice Coen has to step out to guide a wire across the roof rack. Downtown it is busy with fellow rally drivers but once in the countryside we are alone again. This is probably a result of others covering the long stretches at 120 kms an hour while we drive 80. Now that we have left the light pollution areas and without a moon it is pitch-dark. We haven’t got a clue as to where we are. The smooth asphalt is black; so is the forest range on our left while on the right dark meadows stretch towards the horizon. I trust Coen. 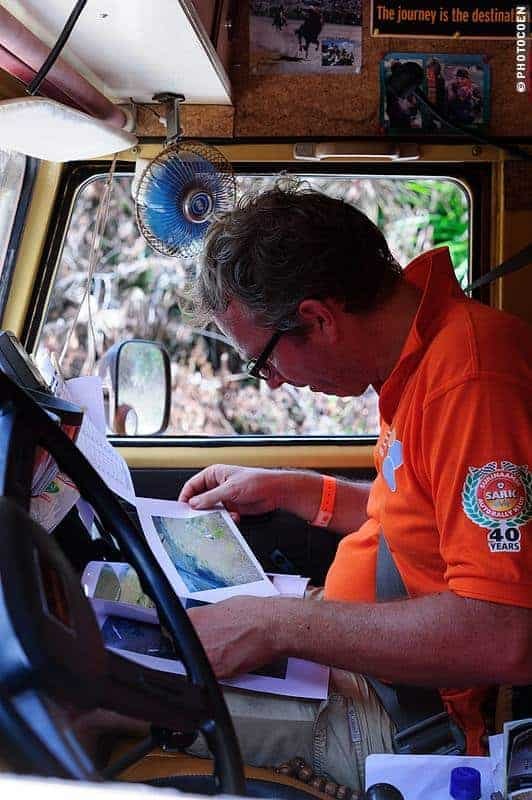 He is doing great in this part of the rally, unraveling the mysteries of different types of maps. There is just a line drawn across a white sheet of paper with 90-degree corners. You have to measure the distance to know where to turn. There are a couple of numbers along those lines, which indicate ORCs. It takes precise measuring to find them and afterward we conclude that we excelled in finding the wrong ones. “Good night,” I greet the teams at every checkpoint. “Good morning,” they emphasize each time. Suriname Dutch and our Dutch at times use different words for the same thing. This can lead to funny misunderstandings, but also to frustrations, as we will encounter later on the journey when we find that they have two expressions that indicate distinct assignments, but that for us come down to the exact same thing. But I run ahead of my story. 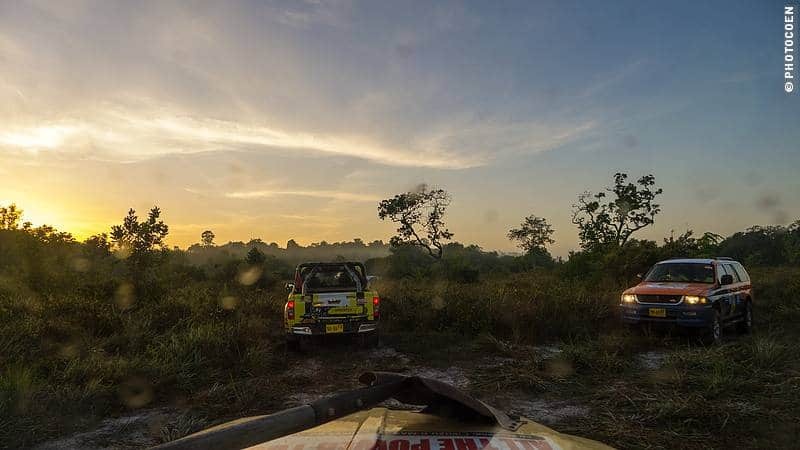 Meanwhile we have traversed the first savanna and as we speed from left to right, continuously in search of those yellow ORCs, the night starts to fade away. From the black night we drive into a grey morning. A dangerous point in terms of tiredness; my eyes are getting heavy. Fortunately, we arrive at our second long break, where breakfast is served. I have time to close my eyes for 20 minutes after which I feel invigorated again. We are handed road book 3, which starts with a compass assignment. We screwed up big time with the compass during the previous rally and decide not even to bother this time. Not only that, the second hurdle is a steep hill of soft dune sand. As we stand at the foot of it, rally cars speed uphill and get stuck, often on a slant. No way are we going to try our luck here. Where ordinary cars tilt on a slant, ours with a heavy and high top is too much at risk of toppling. We turn around and head for the main road, searching and finding a Recovery Point. The most stunning part of the rally, in terms of our surroundings, takes all morning: the savanna. 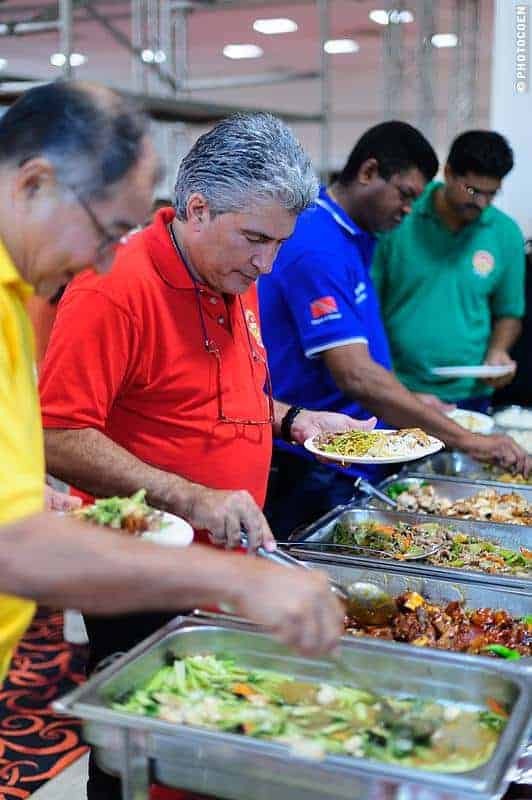 We were told to expect mosquitoes and dressed accordingly (aircon cars didn’t have to bother of course), but there is no biting insect to be seen. 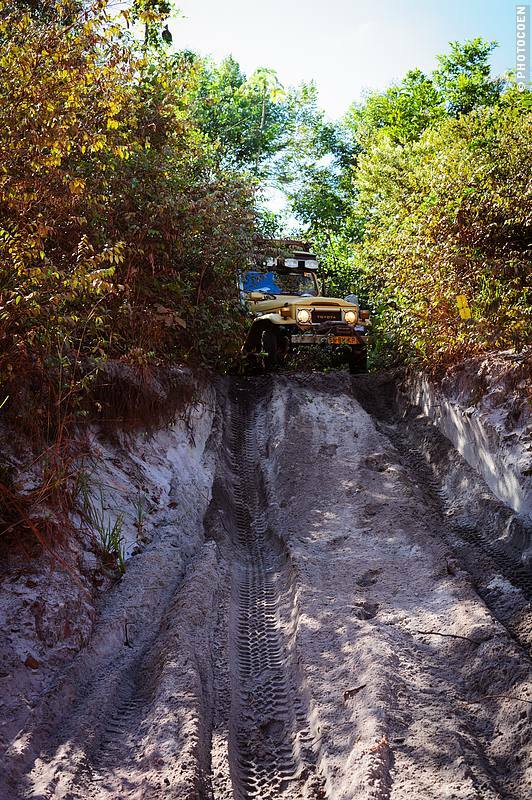 All the easier to enjoy the fantastic landscape of endless tracks meandering through marram grass dotted with islands of scrub or small trees, or leading along forest ranges characterized by palm trees. The driving is beautiful, for once we have a clue of where we are heading and jot down one ORC after the other on our scorecard. In order to get to the other side of those forest ranges we have to zigzag over two-meter-wide paths that cut straight through the forest. 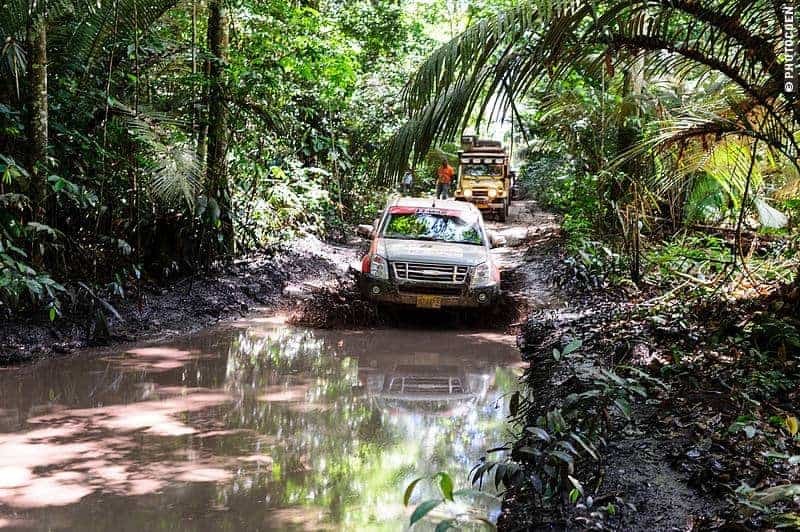 We go at snail’s pace again, the low-hanging branches being serious obstacles for the Land Cruiser. In order not to damage the high-air intake, awning or the roof tent I maneuver carefully. One tree is definitely in the way, with a thick, long branch hanging too low across the path. Coen climbs on the bonnet and uses all his strength to push it upward while instructing me. 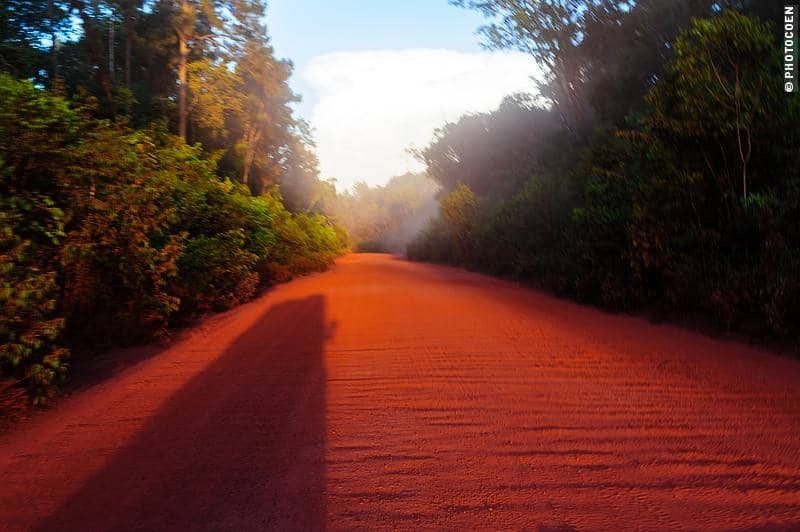 “Stop.” “Go.” Wait.” “Slowly.” “Bit more.” We manage and when afterward I move to the side to clear the path, ten worked-up rally cars speed by. Coen opens the last map of this road book. “What is this? The text says we have to drive from C to H, but on the map there are only a G and H.” Suspecting another of the typical rally kisis (jokes) that are woven throughout all assignments we are confused once more. “I’d better go and ask a crack,” Coen concludes. 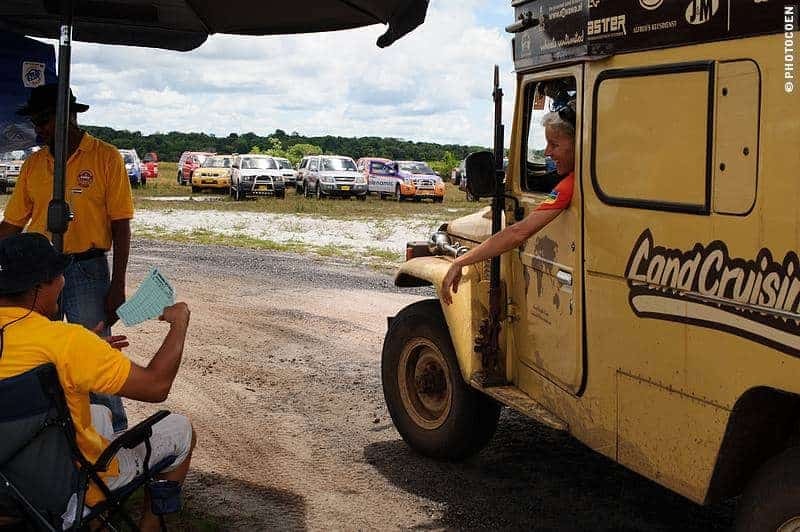 Many rally drivers have been helpful throughout all stages in getting us to stay – or get – on track. Coen walks up to a fancy car and the driver rolls down the window of his fridge. Coen lingers to take in the cool air exiting the window – the sun is beating heavenly on the Land Cruiser by now – while asking for the logic of this assignment. Apparently there isn’t one, it is just a typing error. One more break, where we are served fried rice and water melon. It is 1pm. Truth be said, I’m done. It would be fine with me to finish here. Instead we are presented with road book 4. A deep breath and off we go. This starts with a ball-arrow assignment. Small drawings of arrows and dots in our road book tell us where to turn, but Coen also has to measure very short distances in between those points. Without a trip teller (a fancy digital gadget for rally drivers that indicates distance, times and what have you) this becomes a mission impossible. Another Recovery Point is called for and we leave the savanna. 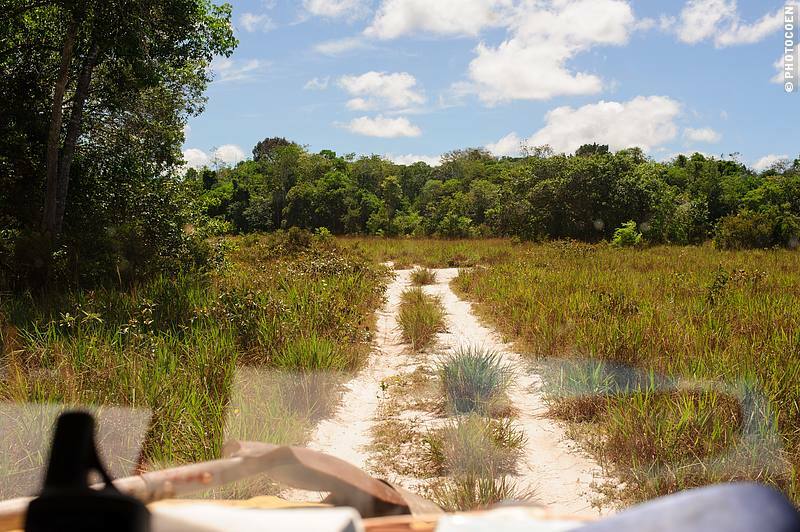 The last three hours cover the return journey to Paramaribo, divided up in different assignments. At some we fare excellently, at others we fail miserably. The last stretch downtown Paramaribo goes like a rocket. Only afterwards, not unsurprisingly, we find out that we have once more collected the record number of wrong ORCs. But it doesn’t matter. 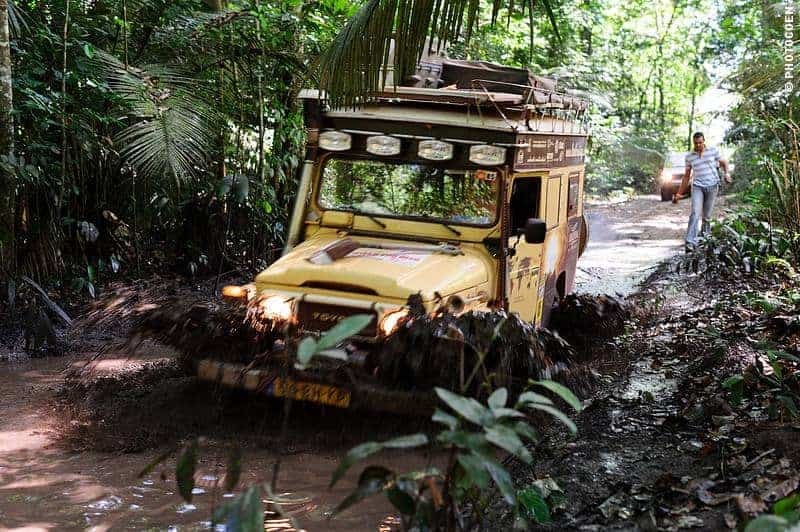 We have been part of an excellently organized rally that still holds a lot of intriguing mysteries for us, and have seen a part of Suriname that otherwise would probably have remained unknown to us. At 3.30pm we hit the parking lot of TBL Cinemas, the finish of the rally. We hand over our last scorecard and let ourselves down in the first chairs available. We quaff a one-liter djogo (beer) in heavy gulps and are fed one more meal. The last hour of driving to our home in Alkmaar is tough. Time for bed! Thanks, SARK, for this fantastic experience. 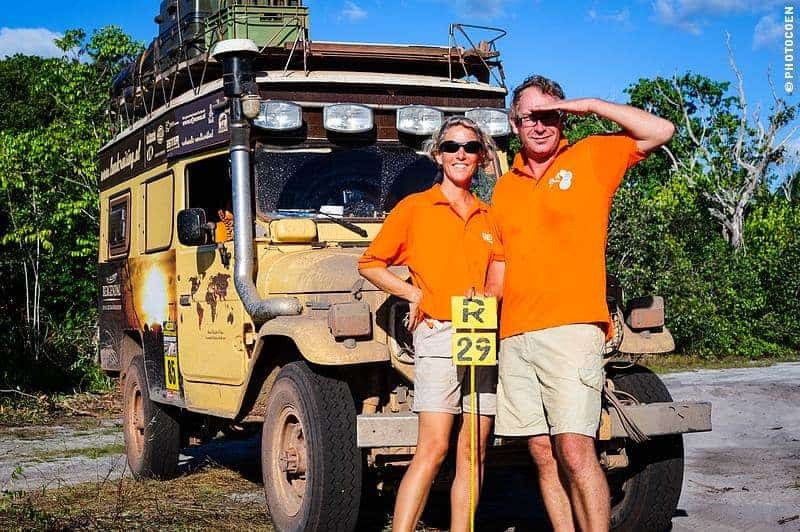 The SOL Car Rally was a great introduction to the true challenge: the 4-day Savanna Rally. While the SOL Rally is more a local affair (but foreigners are more than welcome to join! 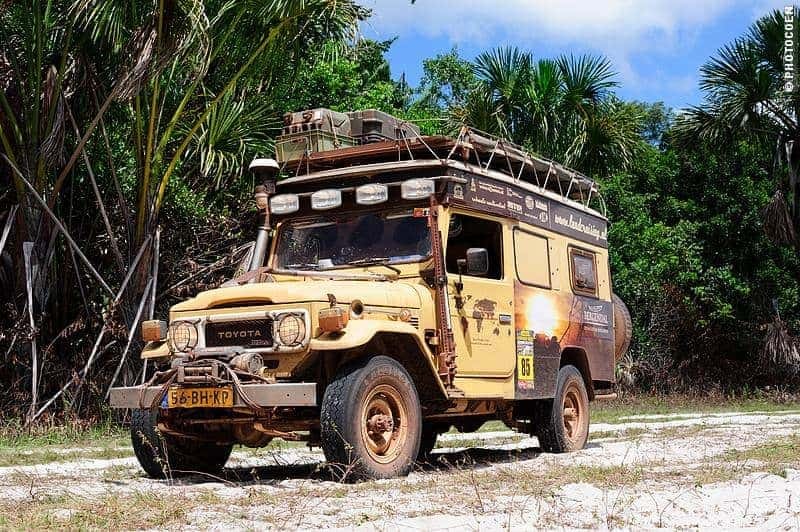 ), there are quite a number of foreigners who participate in the 4-day Savanna Rally (beginning of November). 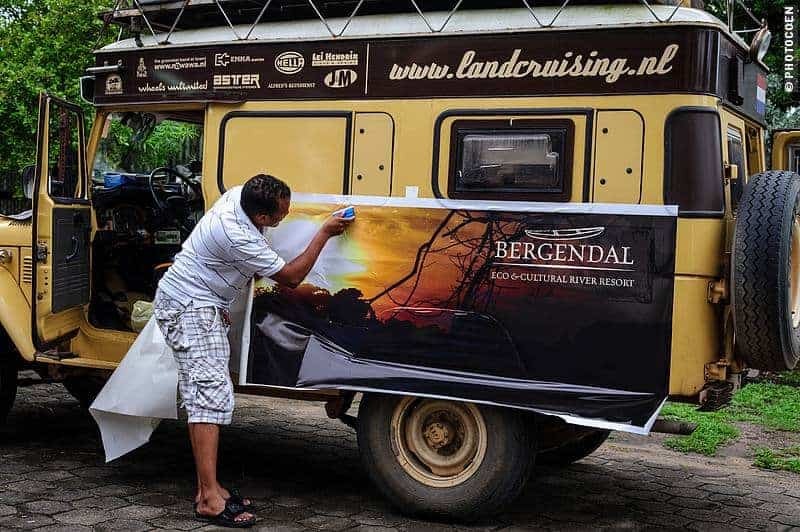 You can do so by shipping your vehicle to Suriname or by renting an equipped one in Paramaribo. On the SARK website is a contact page where you can ask for more information on the subject.